Is y’all done or is y’all finished? Thanks very much, was hoping you’d continue into season 3. Did you drop Clockwork Planet ? I have no knowledge of the inner workings of DDY, but there is a certain member of the Clockwork Planet team who went MIA and put several projects in limbo. This is life, its hard to understand. Everything except Anime de Wakaru Shinryounaika, DanMachi Gaiden: Sword Oratoria and Clockwork Planet will be finished. Even the aforementioned have a small chance to be finished someday, but I wouldn’t hold my breath. fansub groups have lots of people, the shows you’re waiting for are probably stalled at different people than the ones working on current shows. However, I will say that groups tend leave projects stalled at one person when others could pick up their slack but they never do. It’s common for groups to leave multiple episodes stalled at one person for months on end. Picking up other people’s slack is such a pain. I thinks you should use tag \3vc(H0000FF,H00FCFF,H05FF00,HFF5E00) for OP lyrics. Thanks! Thank you so much. I was waiting for this. man, they’re slaughtering through medium-people again. there soon won’t be any allys left. Actually there already isn’t. 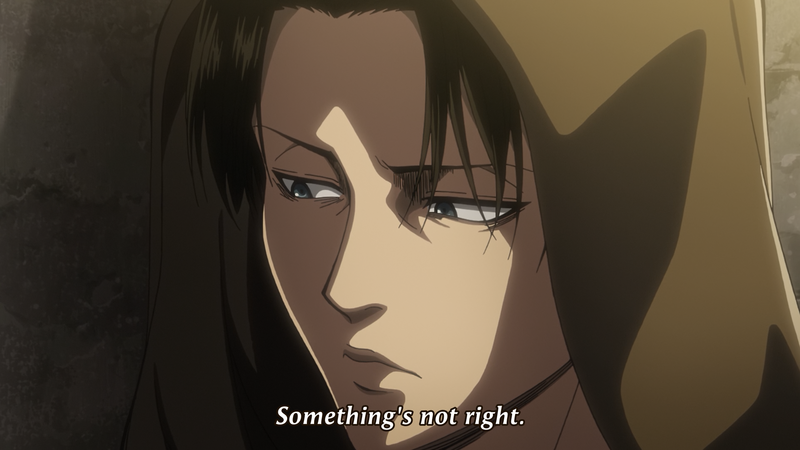 Just levi, hange, erwin, recruits and maybe 1-4 unnamed chousa heidan people we might have seen before. That’ll be interesting what’ll happen next. just a random question, is there a chance that you do Wakfu BDs? yeah i know it’s cartoon but it’s a great series and i think everyone will love it too,i especially love how they execute war scenarios and dynamic actions. Full metal panic invisible victory episode 11 and 12, where art thou? Hi, please use source audio for encoding (in FLAC). Especially in this case since there is no lossless audio available so it’d literally be useless bloat. Hi can I know what type of audio and video codec you get from source, I thought source(Bluray, DVD, anything idk) uses lossless audio codec. This is not a Bluray rip. Blurays do use lossless audio, but this is either a TV or a Web rip (I’m not sure which) and both of those will have AAC audio. The audio is most likely not re-encoded or processed at all, since Begna knows what he’s doing. The rest of what you said is correct though. So TV or Web rip=streaming sites/services. Damn I thought it was DVD/Bluray. Also if you re-encode a audio then you will end up getting more worse audio. The first episode took only 4 days. What’s taking you so long to release the second one? they’re gonna go for juicy double release! Progress on No Game no Life movie? can’t i get a 720p ver? from somewhere else is fine as well. It’s possible that one person held up the release of episode 2, so the other members finished their obligations for episode 3. Just a guess, that guy is probably bullshitting. Where is episode 39 and 40. Are you guys still doing it or not. Would appreciate a confirmation on the status of the series, so I won’t have to wait indefinetely, and can instead just watch the Horriblesubs releases.